Better Than Safe is ultimately a story about facing fear and finding things may just be better than expected. Paul is one of those very “together” guys. He’s a wealthy, worldly, successful executive for an advertisement agency specializing in haute couture. The world of high fashion may appear glamorous but Paul knows it can be sheer bedlam. Which is why he’d love to meet a nice, easy going, uncomplicated man. Instead, he meets Seth. Seth is the very opposite of everything Paul is sure he wants in his life. But he may be exactly what Paul needs. If you’re familiar with any of my books, you’ll know I adore the “opposites attract” trope. I love the feverish tension when two unlikely men find they simply can’t stay away from each other. In Paul’s case, he’s sure he has nothing in common with Seth. Except fashion, art and perhaps a heavy dose of physical chemistry. Not a bad start. I’m often asked what inspires me. For me, it always begins with the city in which the story takes place. The Better Than Stories are set in Washington DC, which may conjure images of political intrigue for some, but let’s not forget that DC is also home to the Smithsonian, the largest museum and research complex in the world. For an art lover, it is paradise! 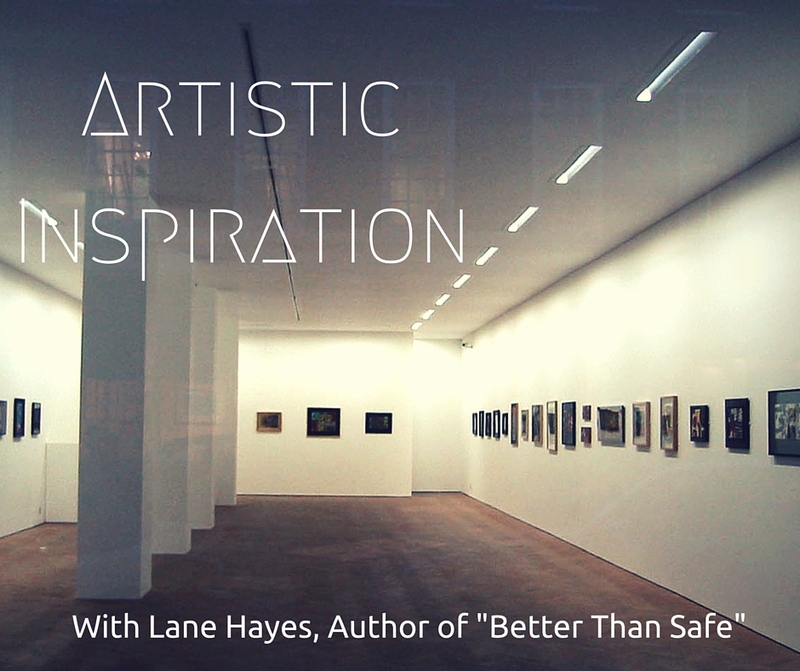 I’ve been hoping to find a way to tie in my love of art to one of my books and Better Than Safe gave me the perfect opportunity. Seth is an artist, Paul is an art enthusiast. Like me, he’d like nothing more than to spend a day getting lost in a museum. Paul appreciates the nuances of the creative process. He understands the quirkier mindset and oddball communicative style that often leads to a masterpiece. And he knows how to “read” art. The heavy-handed brush stroke, the use of color, movement and composition. In the world of art and to some degree, in life, Paul is the consummate observer. Seth is a doer. He’s manic, wild and difficult to know. At one point, Paul likens him to a beautiful bird with a broken wing… able to fly at a moment’s notice, and yet not always sure of his own strength. Finding an unexpected piece of you in someone else is true romance. I love stories of self doubt and personal tension in which a character is certain they have all the answers, only to discover they really don’t know a thing. The process of leaving oneself open to possibility is the beginning of a new start. And ultimately, it’s better than being safe. Books are my first love, but art is a strong second. One of my favorite places is MOMA in New York City. I love modern art in particular. Seeing my favorite Picasso’s on exhibit is a thrill to me. It never gets old! I’d like to giveaway 2 $10 gift cards to Dreamspinner Press. For a chance to win, all you have to do is name your favorite pastime and give an example. For example… I love modern art. One of my favorite pieces is this one by Pablo Picasso. Thank you so much for stopping by today! I’ll be checking in often to say hello, so please be sure to leave comments! Better Than Safe is available now! *Here’s an inspiration pic of Seth, by the way ☺. Kind of gorgeous, eh? I too love art and have an ABD in art history to prove it! My favorite is ancient art and I have several reproductions decorating my desk – an Egyptian stele and an Etruscan mask. Hi Milica! I love Andy Warhol too. I can’t seem to go by the Canned Soup series at MOMA without taking a picture even though I’ve done it a dozen or more times. I have an old Lab (he’s almost 14!) so I understand wanting to spend time with your dog. Animals are very special. And yes… after that, it’s all about a book! I love love reading. Im reading Vespertine right now. I would love to hibernate rest of the year to catch up on TBR list. Thanks for chance. Congrats Lane!! My favorite pastime is really and truly The Ohio State Buckeyes, we live and breathe Buckeyes. So my favorite place is The Shoe in Columbus, Ohio!!! Of course the Schott is right up there too for basketball!! Hi Janie! Thank you! I’m with you… a hibernation period would work wonders for my TBR list! Congrats on the release of Better than Safe, and a happy release day I pre-orderd and i just downloaded it on my ereader, i definitely look forward in reading the book. I also love Art, (i’m dutch so it is kind of expected of us LOL) I’m not an expert but i do enjoy it. I love the older painters like Rembrandt. As for pastime i love to read, read and did i mention read!! I’m kind of addicted to reading so whenever i have some time you can find me with my ereader. Not really an art lover. Occasionally I’ll pull out some counted cross stitch to occupy my thoughts but really my favorite past time is reading. Cliche I know, but reading has pulled me through some tough times in my life and saved my sanity. When RL kicks me or I’m feeling sick I just pull out my comfort reads and transport to somewhere else for a while. Congrats on the release of Better Than Safe – it’s on my Kindle and ready TBR tonight! As a librarian, of course my favorite pastime is (and hopefully will always be) reading. I could spend all day and most of the night lost in a good book. Second to that would be music of all sorts – I love to listen to it and I love to sing. I love art too. I used to live in DC and I spent so much time in the National Gallery and the Smithsonian museums. I miss them! My favorite artist is Botticelli, and it was an amazing moment when I got to visit Florence and see Primavera in person. Other than art, I love reading of course, and dance, ballet especially. Thanks for your post! Thank you! Music, books… and art! All favorites of mine! I hope you enjoy Better Than Safe! I’m traveling this weekend so I’m a little jealous of your reading time! I’ll have to squeeze in a couple hours. Btw, what is your favorite kind of music to listen and/or sing to? As a former DC resident you’ll definitely recognize a couple of the galleries mentioned in Better Than Safe! Lol. I was Italy four years ago with my husband and had a chance to visit some awe-inspiring museums! (And eat incredible food!) Funny you should mention ballet… I love it! I actually did ballet until I was 20. I wonder if I could even stand in toe shoes now? Happy release day! My favorite pastime is reading and Better than Safe is on my Kindle. I do love to visit museums and lose myself in a painting or two but with four children I haven’t had much opportunity. I love Van Gogh (another Dutchie here) and the French impressionists. But I also love architecture, drop me in an exciting city and I will walk into things ’cause I’m looking at the buildings, not where I’m going. I haven’t seen the Anderson Collection. I’ll have to check it out sometime when I’m in Northern California! When I was a teenager, I could be found either in a record store, book store or library. In a way, I feel sorry for today’s kids that they don’t have the same physical connection to books and music the way we did. I would pour over song lyrics and memorize which songs came in which order and the feel and of books… wow! Don’t get me wrong, I’m in love with my Kindle (and iTunes! Lol!) but adventures in book stores and record stores aren’t what they used to be. Yay! Hope you enjoy Paul and Seth’s story! I think we’d do well visiting new cities together. I’m a map queen, so I can point you in the right direction if you get lost! I’m really hoping to squeeze in a trip to Europe next year. I suddenly have a longing to go back to The Netherlands! Congrats one new release. Sadly I never had much appreciation for abstract art/paintings. I’ve always been more interested in sculptures or pottery. Jennifer McCurdy makes some beautiful pieces. I’m glad to know that each book is a stand alone, it makes it easier for me to follow the series. Thanks for the chance. Congratulations on your newest and much success! Thank you! Sculpture and pottery are both beautiful art forms. I love them too! I’m a fan of mobile art as well… like Alexander Calder’s pieces. Interesting… and they never get old! Your pieces are lovely! I’m not much of a crafter but I truly admire those who are! And yes… the books are standalones. Enjoy them in any order you choose! I’m a music, movie, and book fan. I love to read, it’s what relaxes me most days. I’ve always been that way, as a child during the summer I’d go to the library more than once a week and check out as many books as I could carry each time. Movies are another big thing for me. For a long time, if I liked a movie I bought a copy of it. I have lots of movies, most of which people who don’t know me would think are my husbands, but they’re almost all mine: action, action/comedy, comedy, a few classic musicals, scifi, and fantasy. My music collection is varied as well: rock, classic rock, hard rock, metal, classical, blues, jazz, and rap to name a few. I’m homebound now and my favorite things are to read and listen to music. My tastes in both are wildly varied. When I was able to, travel was my favorite thing in the entire world. I loved going to NY and spending the day at the Metropolitan Museum of Art and my nights at plays on Broadway. I miss those days. Other than reading, one of my favorite pastimes is camping. I go every holiday weekend with my brother & sis-in-law, then we have almost 2 weeks around July 4th when our parents come too. It’s great to get away, kind of like a mini vacation & since they have a camper, we have all the comforts of home. Ooops! Forgot to give examples. Favorite painting is Portrait of Jo by Gustave Courbet. I used to stare at it for hours. It evokes so many moods and possibilities. Vain, depressed, lost in thought? So many different ways to view her expression. Good for you! I am a hotel girl all the way! LOL! My 18yr old son recently went camping with some friends and insists he’s going all the time now! It always sounds fun, but… somehow I always end up at a Westin! I wish I could visit NYC more often. I absolutely love it! I’m a huge theater buff too and yes… every visit includes a MOMA trip! I’m going to have to look up that painting. My favorites are the Picassos, Cezannes, Matisses & the huge painting of Lilies by Monet. Actually I could probably name another dozen, but I’ll stop now! by William Shakespeare for a group project at uni, since then I’m going through all his works. I also love art, mostly Renaissance art. Congrats on the new release, by the way! Congrats on the new release! I love to travel. I even studied abroad during college just so I could travel (and earn credits at the same time.) Since my work doesn’t normally involve much travel, I take every possible opportunity to travel for work conferences and such. Thank you all for stopping by for my Better Than Safe Blog Post Giveaway. My winners are Milica and Lisa! Congratulations! You’ve each won a $10 DSP gift certificate!